Too Early for My Interview? - Need a New Gig? You have landed an in-person interview and you are on your way to job search success! You pressed your suit, printed extra copies of your resume, and have taken the whole day off to ensure a perfect meeting. To show that you are serious about this opportunity you want to make sure that you are early. But how early should you be? According to professionals, arriving about 10-15 minutes early is the perfect time. You want to give yourself enough time to park, get to the right place in the building, and check in with the assistant. This also offers you a few minutes, in case you need to use the restroom and freshen up. If not, you have a few minutes to collect your thoughts and mentally prepare before your meeting starts. 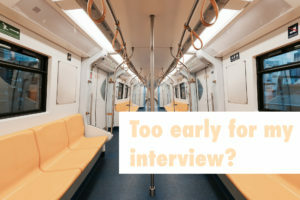 Oddly enough, if you are too early to an interview it could actually hurt your chances of landing the job. First off, arriving too early could make you look desperate, as opposed to just interested. It is important to remember that Hiring Managers are busy with their daily job responsibilities, and if you arrive more then 15 minutes ahead of time, it could mess up their day. The bottom line is that it can show that you don’t do a good job of managing your time. Grab directions to the office and map it out. Hop in your car and see how long it takes you to get there. Once you arrive, identify where you will need to go in, and make sure you know where to park. Remember, if you do a test drive at night, it may not reflect the morning traffic! Be sure to either add some additional time to your commute, or take a quick ride out in the morning. Do some research beforehand, and find a nearby coffee shop or fast food restaurant. If you arrive and have some time to kill, pull off, grab a coffee, and review your materials/resume while you wait. Once you hit that 15-minute mark, head back over and you will be ready to go. If you are still nervous about timing you can always ask them! Give a quick call, or send an email to see what they say. You can ask if you will need to fill out any paperwork prior to your interview, and if you need to for plan extra time before your meeting. This entry was posted in Interviewing and tagged how early, interview, Job Search, too early, When should I arrive. Bookmark the permalink. ← Friday Forum – Can I Negotiate My Salary When I Get a Job Offer?